Soooooo. These are totally adorable. And perfect for Easter this week. And you should definitely make them. Like, right now. I'm super excited about this post for multiple reasons. For starters, I just love it when I have an idea in my head and I not only execute it, but it actually turns out better than I had imagined. Secondly, I've finally conquered my nemesis: peeling hard boiled eggs. I had previously tried every freaking trick in the book to no real avail. (Check this post). But finally, FINALLY, I have discovered the egg peeling Holy Grail, thanks to my friend Kim. 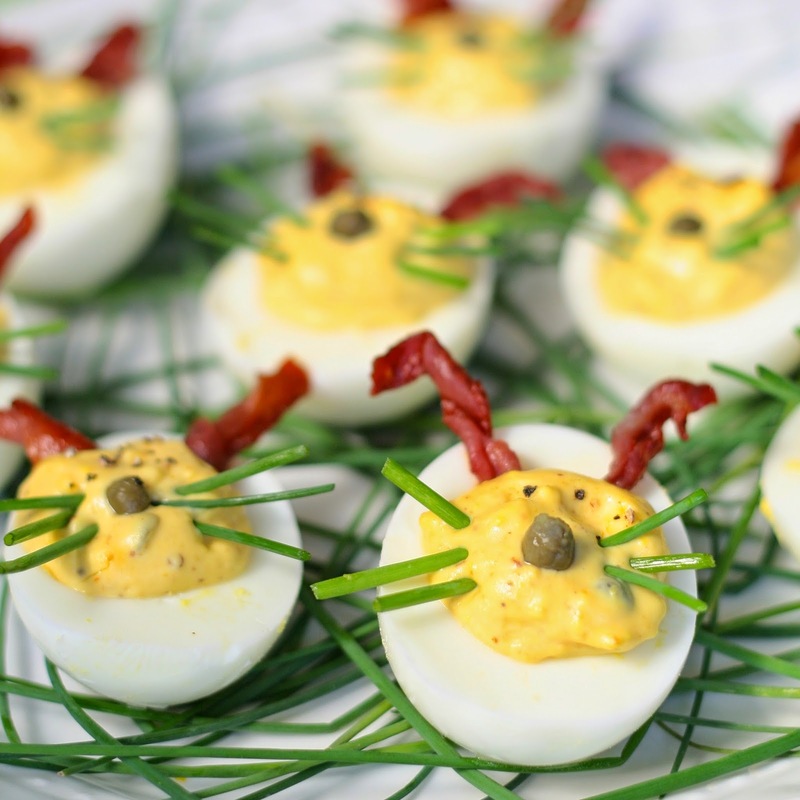 Kim shares my love of deviled eggs, and almost always makes them for parties or dinners. However, she doesn't have the same issues that I do when it comes to peeling them without completely ruining the egg whites in the process. I was visiting her for Thanksgiving this year, and I asked her for like the 20th time what her trick is. She gave me the same answer she always does: "Salt." I explained that I've tried this before and it still doesn't work for me. And then I watched her boil her eggs and realized my mistake. The amount of salt is the key here. I was previously salting the water as I would for pasta. That's not enough. Look at the photo above. See all the white stuff at the bottom of the pan? That's salt. Lots of it. There's probably at least 2 tablespoons in there. And if you aren't sure... just add a little more. It won't affect the eggs except to help you effortlessly peel off those shells. (However, out of old habit, I still make a couple extra eggs just in case). HOORAY HOORAY HOORAY! I texted Kim immediately and said "I'm an egg-peeling boss. Thank you!" As for the actual cooking of the eggs. I bring them just to a boil, then shut off the heat, cover the pan and let them sit for about 10 minutes. Then I shock them in cold water and let them cool completely before peeling. (like a boss). Since I was turning my deviled eggs into rabbits, I needed some ears. Since I love bacon on my deviled eggs, I again turned to a pork product, but I decided prosciutto would be perfect for manipulating into little floppy ears. I cut off small slices from a big piece of prosciutto (you may need 2), and then rolled them up. Fry them in a little oil for about 1-2 minutes, or until crispy. It's ok if they don't turn out perfect. I think they're cuter that way! Drain on a paper towel. Once you've peeled your eggs (like a boss), cut them in half lengthwise and pop out the yolks. For the filling, I did a mix of savory and sweet for a nice little play on some of the flavors often associated with Easter dishes. Along with the egg yolks, I added mustard, a touch of maple syrup (though honey would be good too), mayo (I like Lemonaise), capers, a little apple cider vinegar and salt and pepper. Refrigerate until you're ready to assemble your eggs. Arrange the egg white halves on a platter lined with chives (it looks like Easter grass!) Fill your eggs and assemble your bunnies! Stick two pieces of fried prosciutto up top for the ears, snip some additional chives to make the whiskers, and top with a caper for the nose. I was originally going to do capers for the eyes as well, but they looked kind of scary. So instead, I just added a couple pinches of black pepper to each egg, and it totally worked! Some will look more like eyes than others, but everyone will totally get the concept. Or, you could always try poppy seeds or black sesame seeds. More importantly, they are delicious, so soon no one will care how cute they were anyways. 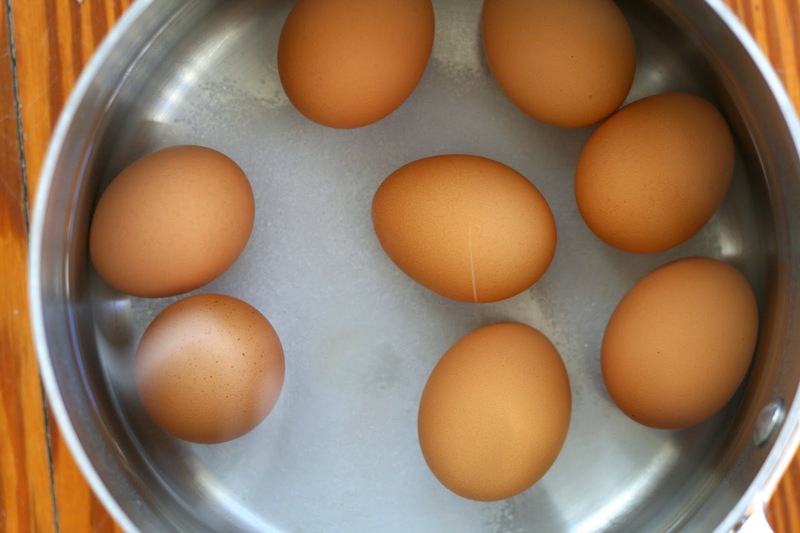 Place eggs in a pot in a single layer. Cover with water and add 2+ tablespoons of salt. Bring just to a boil and boil for 30-60 seconds. Shut off heat, cover pot and let stand for 10 minutes. Shock eggs in cold water and allow to cool completely. Peel eggs and slice in half, lengthwise. Separate yolk from whites. Place cooked yolks in a bowl, and roughly mash. Add mustard, maple, mayo, capers, and stir to thoroughly combine. Season to taste with salt and pepper. Refrigerate whites and yolk mixture until ready to serve. Slice prosciutto into 24 small pieces and roll. Heat a little bit of oil in a pan and fry prosciutto for about 60 seconds, or until crispy. Drain on paper towels. When ready to assemble your bunnies, place egg white halves on a platter lined with chives. Spoon or pipe filling into the center of snip additional chives and insert into the sides of each egg to create "whiskers." Insert two pieces of prosciutto into the top of the eggs for the "ears." 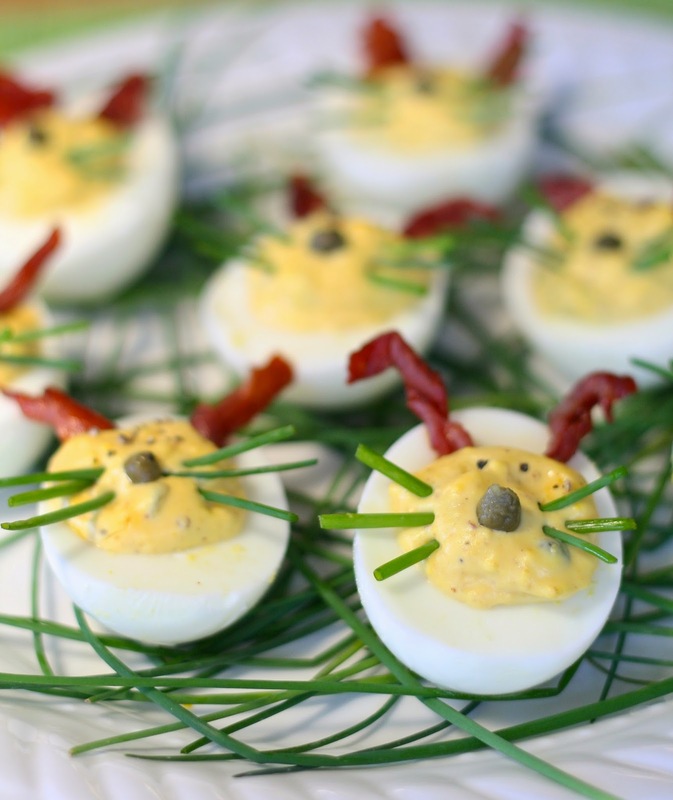 Place a caper in the middle of each egg to make the "nose." If you want to add "eyes" as well, simply add two pinches of black pepper to each egg OR two poppy seeds OR two black sesame seeds. This is a very good idea foe this easter my girls will love this. Thanks!